How about adding a wow factor to your house for the coming summers? Welcome this summer, by giving your home an all new attire with awning for attics or pergola for attic terraces and get your home as summer ready as you. 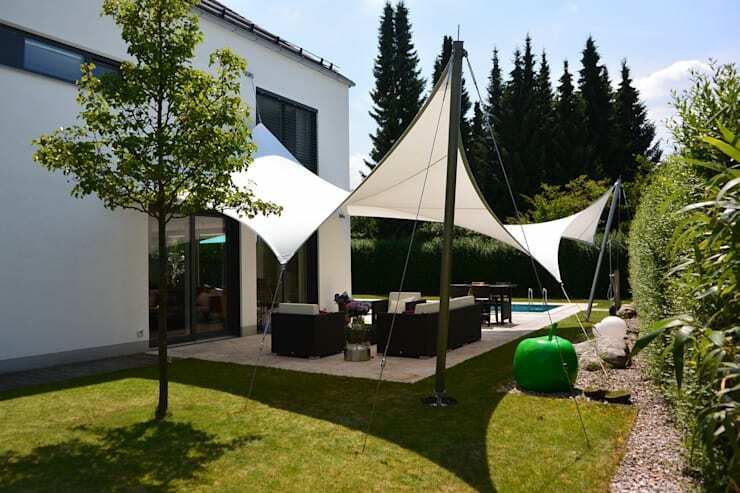 While an awning creates a vibrant environment, it also creates some extra space to put your armchairs, hammocks, a garden set and enjoy the warm hours while the sun shines. If you are worried about the effort required in setting up the awning, don't be. With the new automated systems you can have your perfect summer shade with the push of a button. Awnings can be a saver in rainy season too, giving you some extra dry inches out in the open. Though, the cables and the clamps to maintain the tension in this beautiful looking awning, do take some space around the area, however the wonderful look and maritime feel that they create is totally worth it. This awning is easy to install and remove. 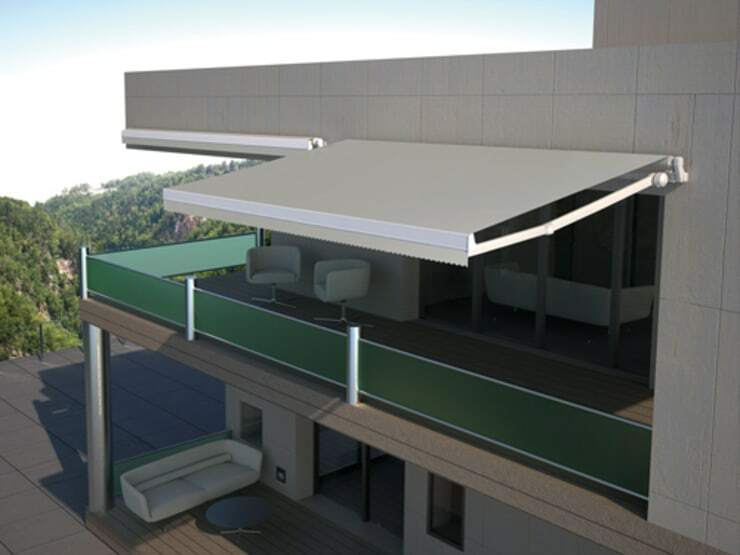 The elegance that this awning boasts of, will be a beautiful decorative ornament to your terrace. In addition, its fabric is water resistant, to guard against the rain, and its arrangement at various angles prevents the water of a storm from falling in one direction. Love spending time outdoors, see 15 porches for people who love outdoor living. A chest awning perfect for the attics, since practically no additional structure needs to be mounted. The awning and its guide are deployed by means of two extendable arms, located on the sides, and when it is collected, the chest occupies a very small surface. Precisely, the chest protects the fabric from dirt and the climatic rigors, especially in autumn and winter season when the awning is not used that much. Discreet, elegant, and easy, this type of awning can also be controlled automatically, if you do not want a manual operation. This is the most common pergola for terraces and attics. It is installed on the facade and is deployed horizontally, by means of guides that are in a porter. 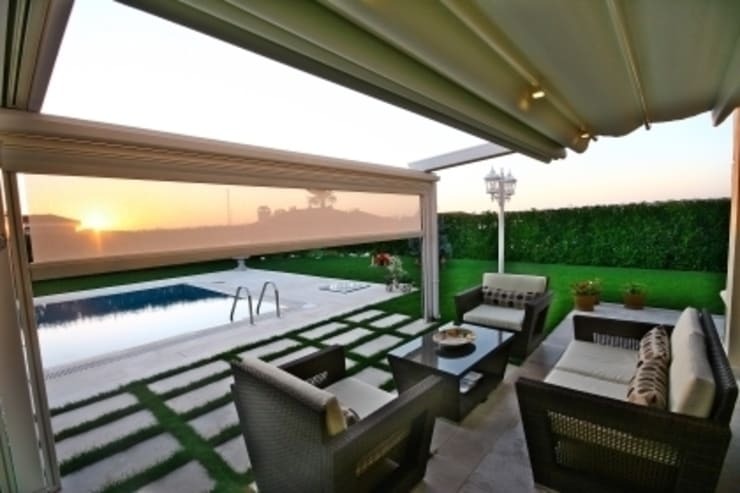 You can install two more awnings with arms on the sides, which allows for more protection from the sun, that can help you control the heat and air by raising or lowering. 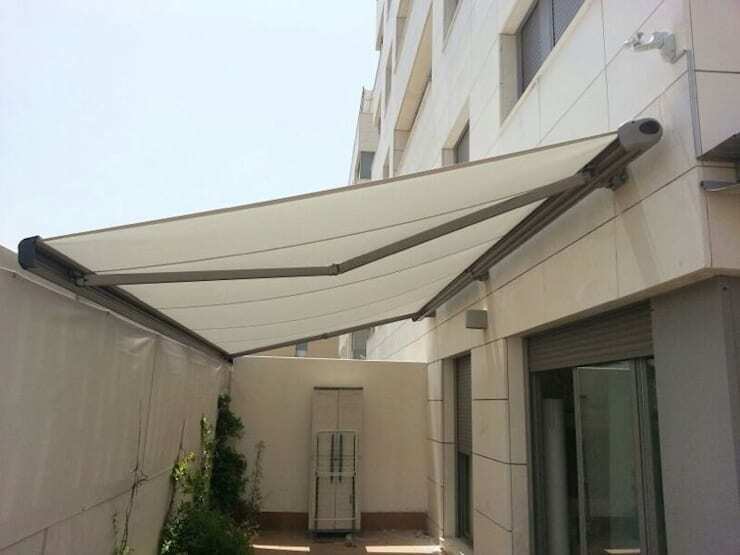 These awnings can be controlled manually by means of a rope, or a small motor can be installed for more comfort. Wondering just how far can an awning with no guides be displayed on its back? If you want to avoid wasting any area on the terrace, you can install an awning like this. An awning with jumbo telescopic arms that will give you the maximum area of shade while wasting a minimum in installation. Tension is maintained on the canvas at all its points, and it can cover an extension of 18 meters long by 5 meters deep. Of course, in this case the form of collection and deployment has to be by means of a motorized mechanism, which when rolled, almost disappears from the view, folded along the upper balcony. This awning can easily be replicated on the terrace. An awning made as a series of canvas strips, which are held by toothpick profiles, made of aluminum. The pergola has pulleys inserted in the guides of the awning, which allows the awning to open and close. You can choose to unify all the strips, or use it by sectors, to customize the shade as per your desire. It is also possible to install enclosures around the pergola, which will help to create a closed new environment to enjoy when the temperature drops, or it rains all of a sudden. Love the idea of pergolas, see 20 pergolas and gazebos perfect for your backyard garden. 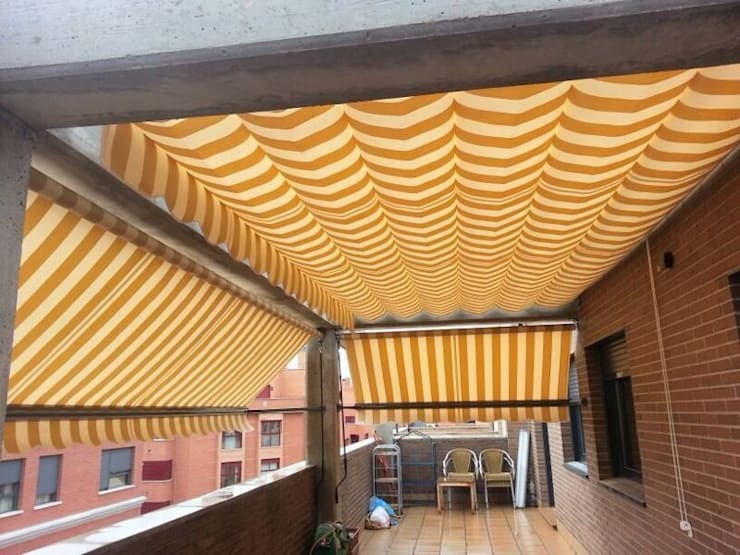 Here is an example of an awning on the balcony with extendable arms, which allows to reclaim some space, which would often get wasted in the hot summer days. The extendable arm system allows the acrylic fabric canvas, to unfold quickly and occupy a large surface area. When it retracts, it folds and occupies a minimum surface next to the wall. The structure made from aluminum, allows it to be lightweight and resistant at the same time. The awning can be easily automated to save effort and you can sit back and enjoy the space it creates. 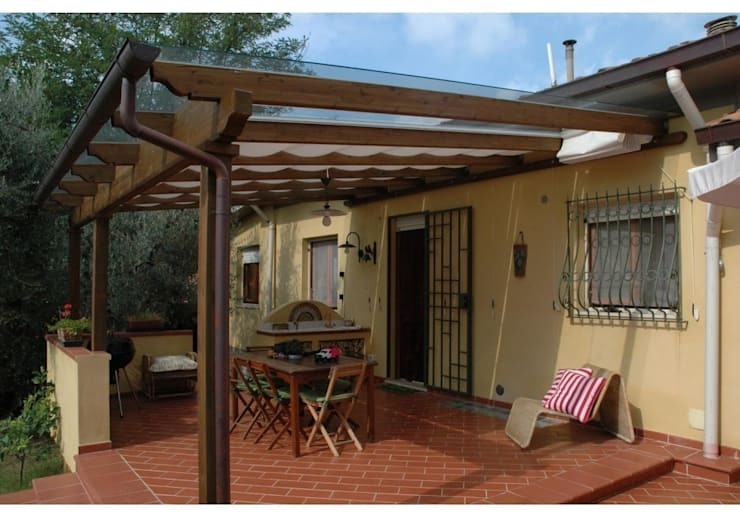 Awnings are usually associated with summers, but in the countries where spring and autumn may somewhat be crude, as in Poland, a wooden pergola with a sliding canopy, which can be opened by sectors is a perfect solution. Here a glass top has been installed, that allows to enjoy the sun on the terrace, creating a greenhouse effect, and keeping the area below the pergola warmer, even when the temperature is low. See yet another pergola that gives a soothing feel to the house. Here is yet another example of how elegant an awning can be. A white awning complements perfectly well with the walls and floors of this particular estate. 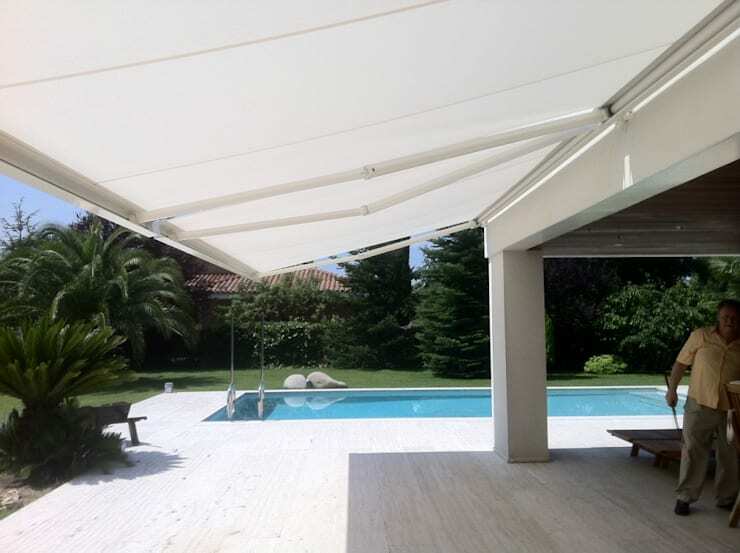 Deployment on an awning allows you a larger area of shade from the sun, without compromising on the heat, a perfect setting around the pool. These awnings can be equipped with wind and sun sensors, and also with automated motors that can programmed to fold or unfold at certain times. Here are 8 amazing ideas for your terrace pergola. Technically speaking, it is not a conventional awning, but it completely solves the purpose. 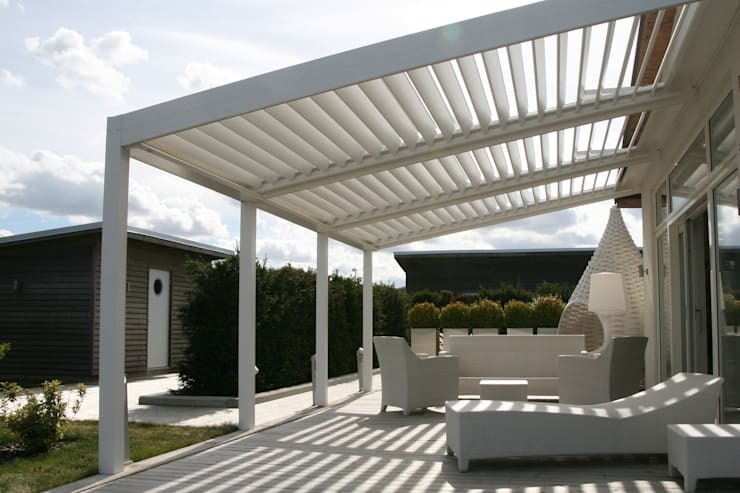 A system of bio-climatic pergola launched by Solisysteme, is a series of aluminum slats, which can be rotated according to the desired degree of shade. The advantage over the traditional awning is that you can create a completely shaded environment, or an ambiance that is nuanced by small sunny strips. 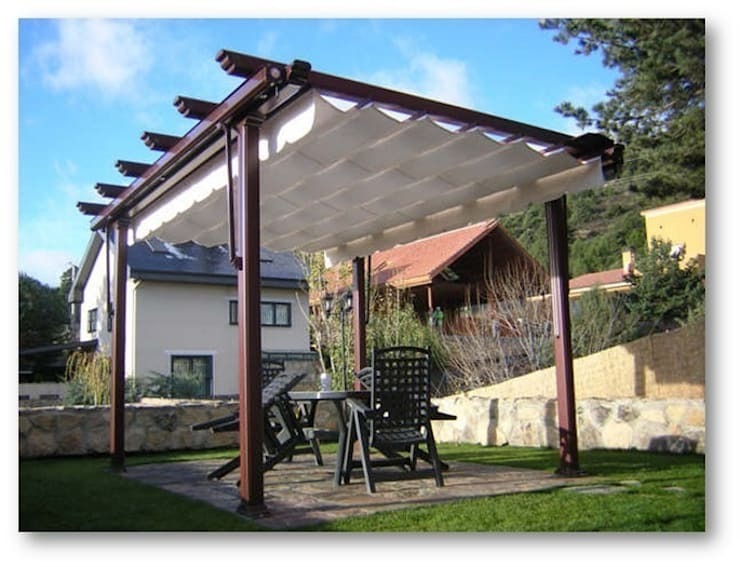 Another advantage that this pergola offers over the traditional awnings is the complete closure it offers, and is much stronger against heavy rains and winds. It can be controlled manually, or by means of a remote control. Can anything be more comfortable? See another breathtaking bio-climatic pergola that will leave you wanting for more. Having an awning on the terrace sometimes makes you feel that the space is not getting that well utilized in the night, as it gets dark below the awning. An interesting solution to this problem, and creating a perfect night party area is to mount an awning with slides, and install lights in the guides. So, when the sun goes down, you can continue enjoying the fresco on the terrace thanks to the artificial lighting. You could even open a part of the awning to allow more air circulation. Isn't that a wonderful idea? Impressed by the idea of installing an awning? 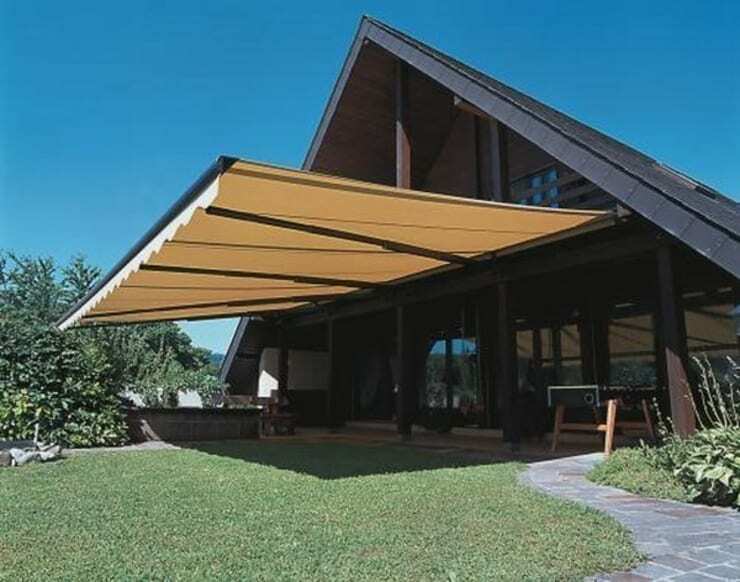 Which type of awning do you think will suit your house the best?